Start with your font of choice. In this case, I chose Lobster 2, but also recommend Lobster, ChunkFive, or Birra. Write out your text or title with the Type Tool (T). 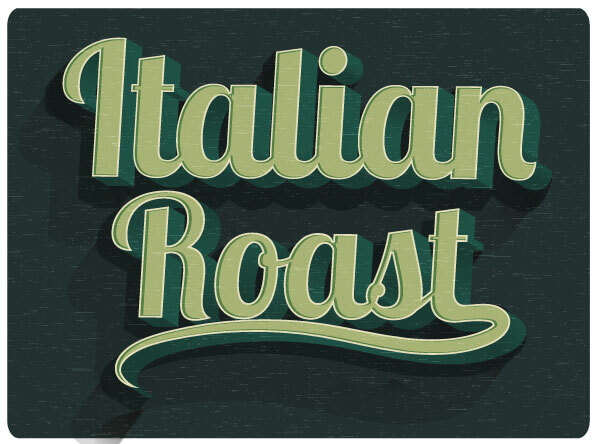 I chose “Italian Roast”, as it’s the name of a type of coffee, and I find this text effect goes well with all things coffee, packaging, and cafe related. 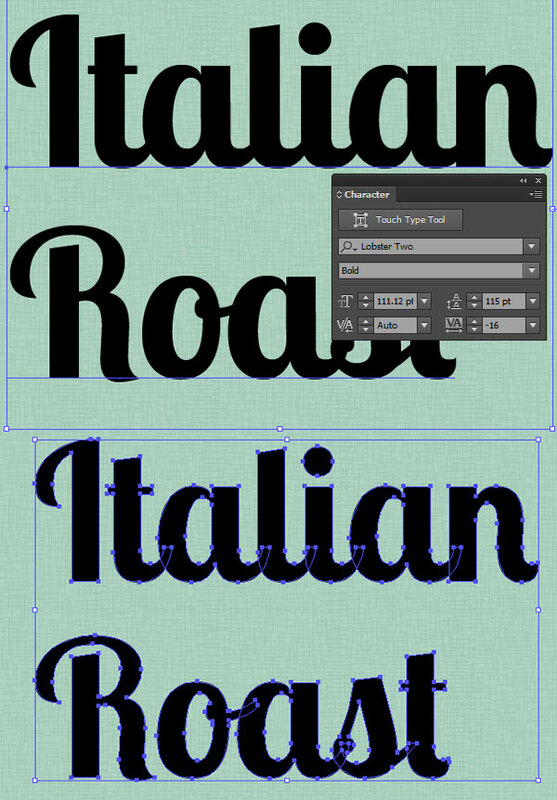 Expand your text to outlines under Object, and then Ungroup your text. 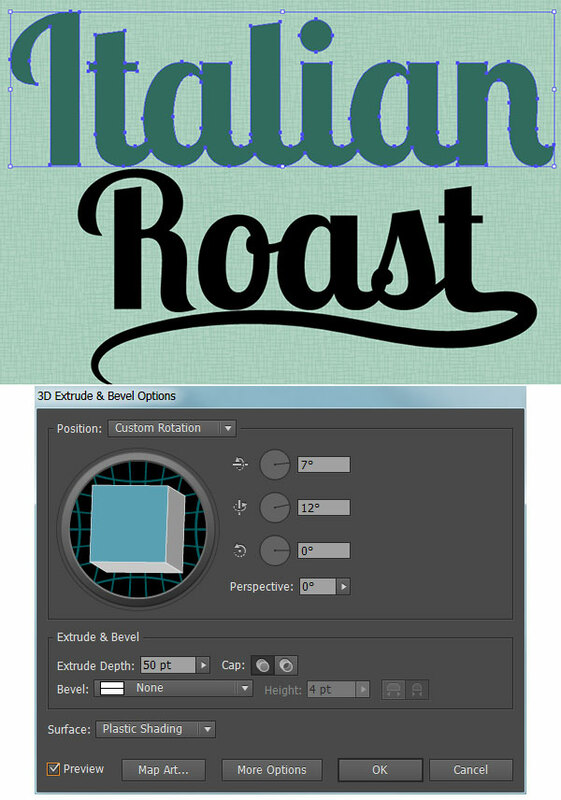 I think the word “Roast” needs a flourish. 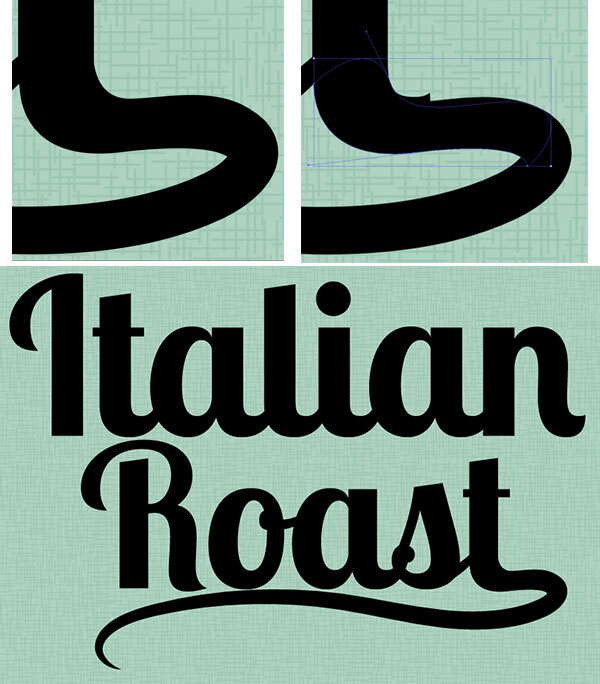 Using the Pencil Tool (N) I drew a swooping line from the letter “T” that moves to the left and stops below the “R”. Apply a thick stroke to the path in the Stroke panel. Use the Width Tool (Shift – W) to taper the tail of the flourish by placing points with the tool near the end of the tail and dragging our mouse to make the path thinner at that end. 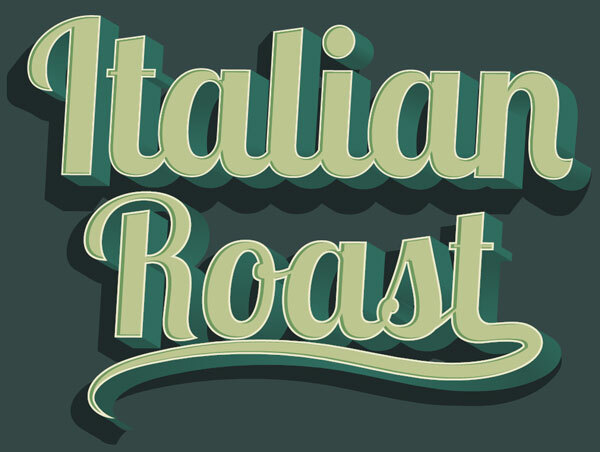 Once you’ve got the flourish in a position and shape that you enjoy, Expand it in Object and Group together with your word (in this case it’s been Grouped with “Roast”). 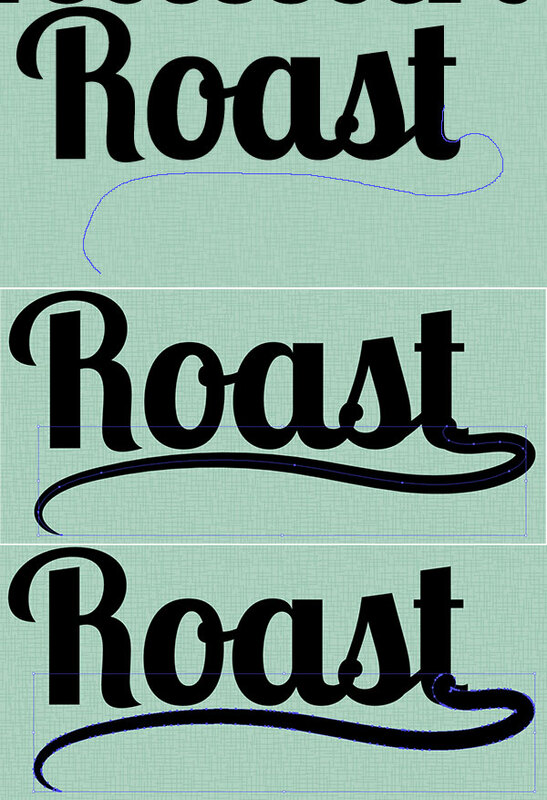 In order to make sure the flourish drawn in the previous step fits in with the text group seamlessly, Zoom (Z) in so you can work on the details of the final letter. I’ve used the Pen Tool (P) in order to draw a shape that hides the little kick on the end of the “T” and flows into the expanded flourish path. This may be easier to do if you’re using a graphics tablet and the Pencil Tool (N) if you want your curves to flow with quickly drawn lines. 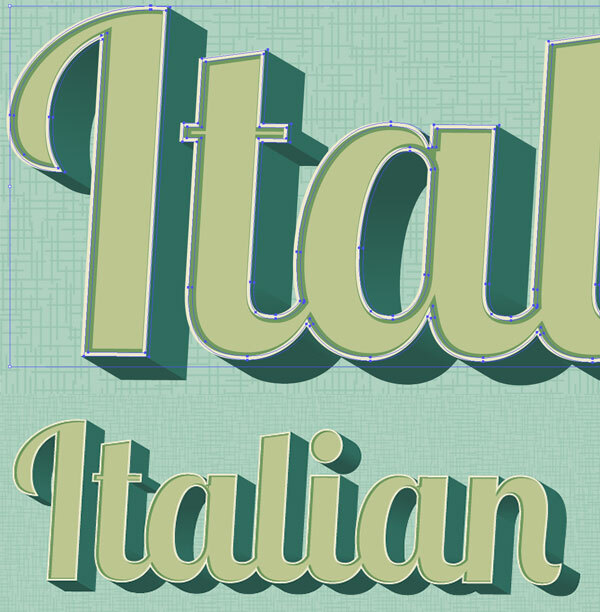 With your new 3D text selected, Expand Appearance under Object and Ungroup. Select the face of the text (the letters without their 3D counterpart) and set the fill color to a light color: cream, pale mint, etc. Group together the 3D components of lettering. We’ll be adjusting the fill colors of those pieces in the following steps. You’ll need two colors for the 3D components of your text. In this case I chose teal and darker teal. 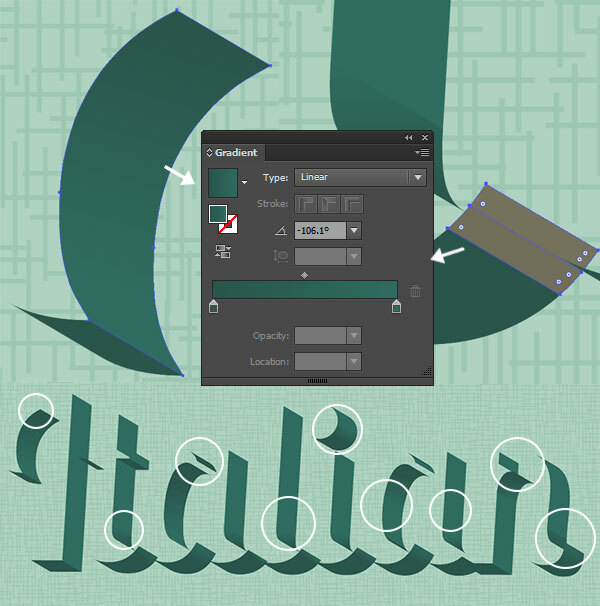 Using the Direct Selection Tool (A), select the bottom components of the 3D text and apply the darkest shadow color as the fill color (see below). 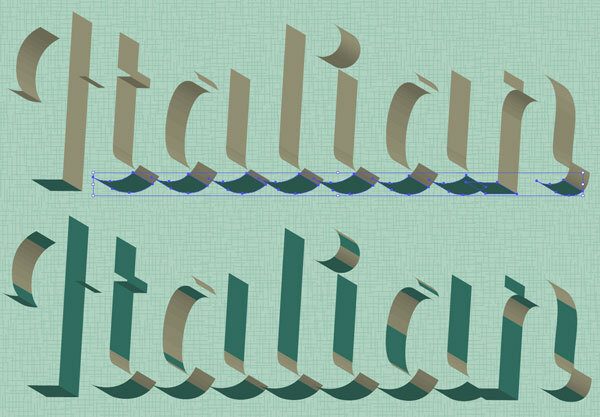 For anything that is on the right side of each letter and not a part of a curve, apply the lighter shadow color as the fill color (see below). 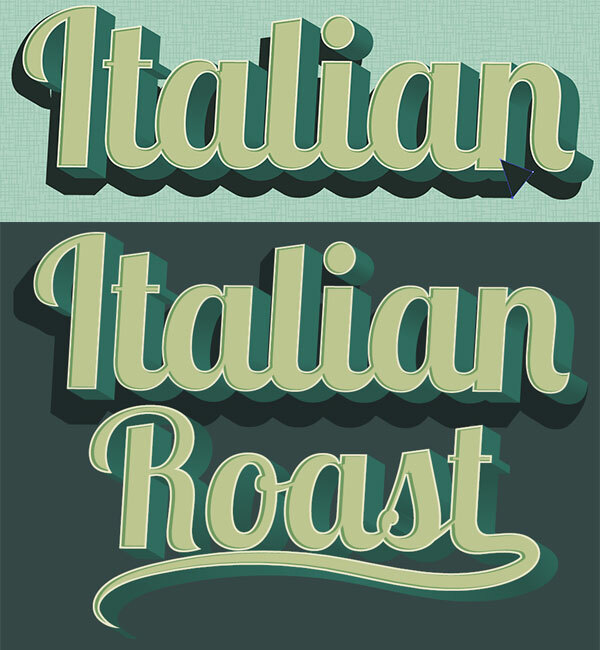 For curving shapes in the 3D text, you’ll apply a Linear Gradient going from the lighter shadow color to the darker shadow color using the Gradient panel to sort out the gradient’s angle. I’ve circled the sections of the 3D portion of the text where the gradients were placed. Once satisfied with the shadow colors and gradients of the 3D text, make sure it’s all Grouped together and Unhide the rest of your text. Repeat Steps 4-7 on any other text you may have in your artboard. Select the face of your text (the group from Step 5), Copy (Control – C), Paste (Control – V), and go to Object > Path > Offset Path… where you’ll apply a -1px Offset. 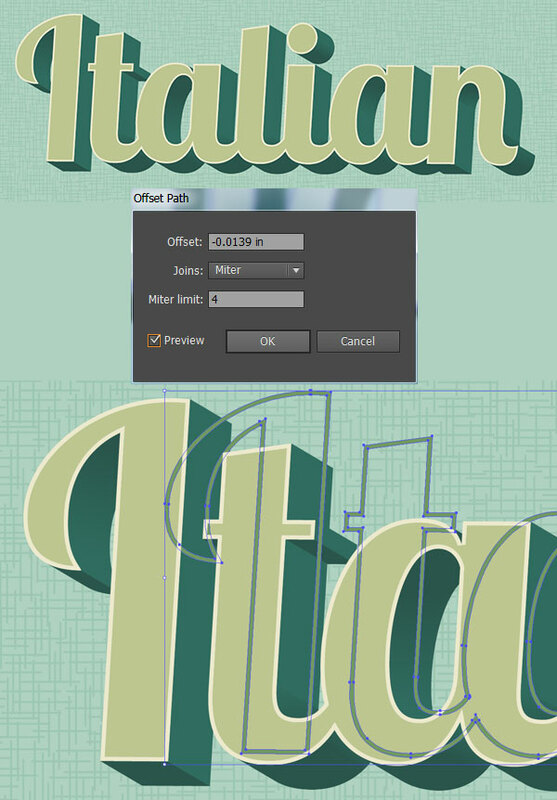 With both the copied text face and the offset objet selected, hit Minus Front in the Pathfinder panel. For the fill color, choose something lighter than the text’s face color (light cream, seen below). 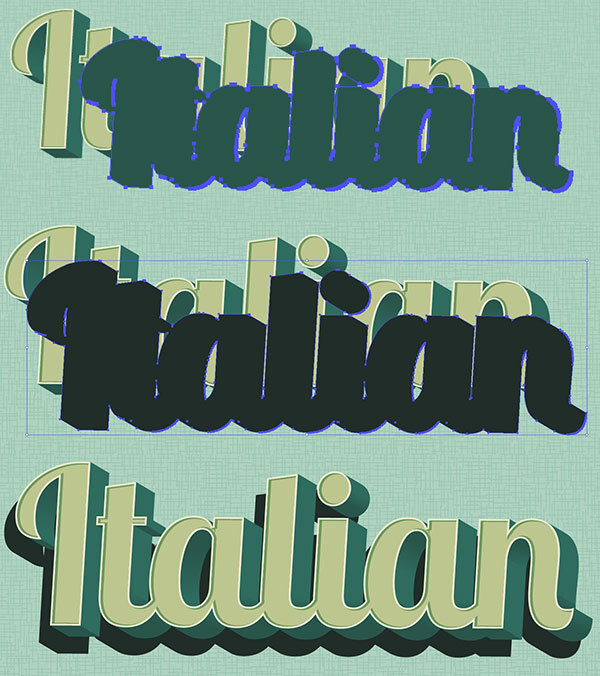 Copy and Paste this outline shape and apply a color darker than the mint used for the face of the text. Place this second outline shape to the right of the light cream outline shape and below it in the Layers panel. Copy, Paste, and Align (in the Align panel) the text’s face group with itself. With the copied face and the green outline shape selected, hit Control-7 in order to create a Clipping Mask. Repeat Steps 8-9 on your other text (if applicable). Group your text together, Copy, and Paste. Unite the Pasted text group in Pathfinder. Set the fill color to an even darker color (in this case a very dark teal) and place it behind the text group in the Layers panel. Move it to the left and downward (see below) so it forms a bit of a drop shadow. The background I’ve been using (whose texture was not covered in this tutorial, since it’s not a part of the final piece) is much too light for this color scheme. Using the Rounded Rectangle Tool, I drew a rounded rectangle over the artboard, behind the text groups, in a green-gray color. Reapeat Step 10 and give any other text a simple drop shadow. Copy and Paste the drop shadows twice into two separate groupes. Reduce the Opacity of the second group to 10% in the Transparency panel. Make sure it has been moved to the left and downward from the first group. 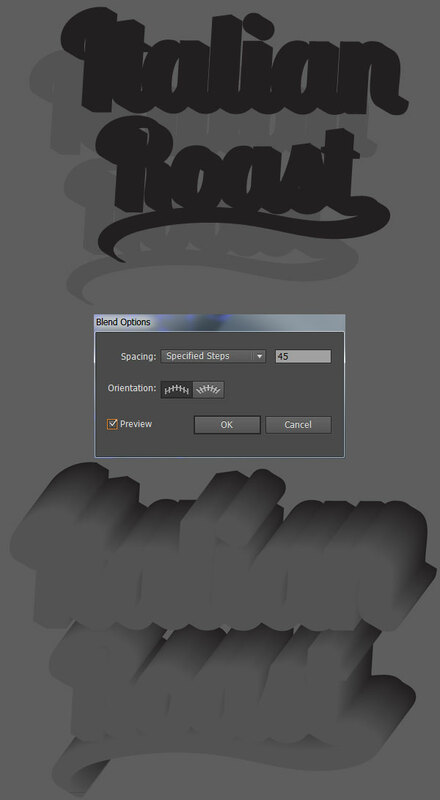 Use the Blend Tool (W) to apply a smooth blend of 45 Steps. Place this blend group behind the drop shadows and text. For the texture used over the top of the final piece, Copy and Paste the background rounded rectangle, but make sure it’s above the other layers in the Layers panel. 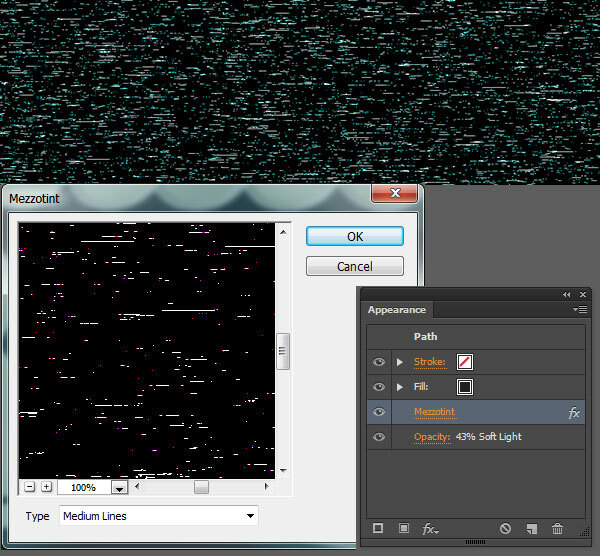 Set the fill color to dark gray and go to Effect > Pixelate > Mezzotint. Choose Medium Lines as the Mezzotint type. In the Transparency panel, set the Blend Mode to Soft Light and Opacity to 43%. You’ve done it! Your retro text has been given a kick in the right direction. Play with long shadow shapes behind the text, add in other flourishes, effects, and designs in order to take this fairly simple text effect to the next level. I read it over and over…..you lost me on step 9. You’ll need to contact Vectips directly, as the authors are just commissioned by the site (typically we’re the ones replying to comments since the deal with each post content directly).